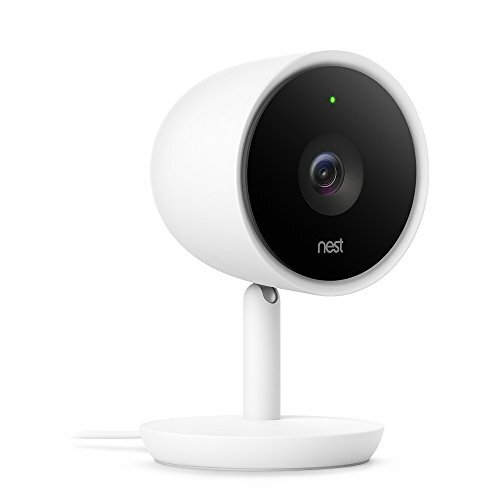 Nest follows the blueprint of the Nest Cam IQ indoor camera with its second outdoor model. Nest's IQ Outdoor is a great home security camera but there are some things you need to know before buying. With the introduction of the Nest Cam IQ last year, Nest began to evolve the Dropcam platform it had acquired several years earlier. That camera’s hardware and software upgrades appear to be the blueprint for Nest cameras going forward judging by the fact they’ve been ported wholesale to the new IQ Outdoor. Nest already offers an estimable outdoor camera in the Nest Cam Outdoor, and the all-new IQ Outdoor shares many traits with it, including a 130-degree field of view, up to 1080p video, and a similar sturdily built cup-style design. But in every other way, the IQ Outdoor is a leap forward thanks to features cribbed from the indoor IQ camera. The most impressive of these is “Supersight,” which leverages a 4K image sensor, High Dynamic Range (HDR), and person detection. If the IQ Outdoor sees a human, it will zoom in up to 12x (digitally) and follow the person’s movements. It will also balance lighting conditions so that details aren’t blown out in highlights or lost in deep shadows. It's important to note, however, that you'll never actually see 4K video from the camera. The image sensor brings extra clarity to the 12x digital zoom, but the camera only ever streams 1080p video to the cloud. The Nest Cam IQ Outdoor features many of the same upgrades as the IQ indoor camera. IQ Outdoor also improves audio—it’s 15x more powerful than the original Outdoor, according to Nest—courtesy of a more robust speaker and a three-microphone array with echo cancellation and noise suppression. Weatherproofing has been upgraded as well. The IQ Outdoor boasts an IP66 rating (a bump from Nest Cam Outdoor’s IP65), meaning its dust tight and protected from blasts of water, and it has a greater operating temperature range (–40 degrees to 113 degrees F compared to the Nest Cam Outdoor’s –4 degrees to 104 degrees F). 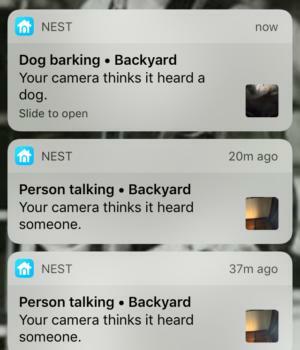 Another welcome change: Person alerts come free with the purchase of the IQ Outdoor; they required a paid Nest Aware subscription with Nest’s original outdoor camera. A paid subscription, however, will transform person alerts into facial recognition and enable Familiar Face Alerts, a feature Nest introduced with the indoor IQ that lets you train the camera to distinguish between people you know and strangers. It also unlocks Intelligent Audio Alerts, which differentiate between speaking, barking, and other triggering sounds. And a subscription is required to use Supersight. Intelligent alerts distinguish between human and non-human sounds. Nest offers a pair of Nest Aware plans: Basic stores 10 days of video for $10 a month or $100 per year, and Extended saves video for 30 days for $30 a month or $300 per year. One of the most attractive features of the original Nest Outdoor is its plug-and-play installation. With its magnetic mount and weatherproof power cable, you could stick the camera on a metal eave or rain gutter, plug it into an outside electrical outlet, and be up and running. Installing the Outdoor IQ requires considerably more effort. Its 25-foot power cord is not weatherproof, so it needs access to an indoor outlet. As the cord is threaded through the camera mount, you’ll need to drill a hole through an exterior wall if you don’t have a ready opening, and then screw the mount to the wall with the supplied hardware. The upside is the Outdoor IQ is less likely to be pilfered than the Outdoor. With the same hardware improvements as the indoor IQ, the Outdoor IQ’s audio and video quality were predictably stellar. Video was sharp with vibrant colors. With night vision activated, the image had strong tonal contrast with plenty of detail. The audio was full and loud without booming or distortion. As soon as the IQ Outdoor sees a face, the Supersight feature kicks in, tracking that person’s movements. This is where you really see the benefit of that 4K sensor as the camera zooms in on the person’s face without any detectable loss of image quality. The Nest app makes it easy to find daily videos of recorded activity. When the IQ Outdoor sees a face it doesn’t recognize, the Nest app shows you a screenshot and asks you if you know the person with the option to tap a checkmark for “yes” or an X for “no.” For each person you know, you can add a name in the app’s Familiar Faces library. This isn’t a one-and-done exercise, though. You’ll continue to get generic person alerts for people you’ve already identified, but as you continue to “teach” the camera who your family and friends are through this process, you’ll start to get more accurate facial recognition alerts over a couple of weeks. A perk of using the Nest system is that any faces already recognized by the IQ indoor can be matched against those detected by the IQ Outdoor, effectively shortening its learning curve. Intelligent audio alerts, on the other hand, were accurate right out of the box. 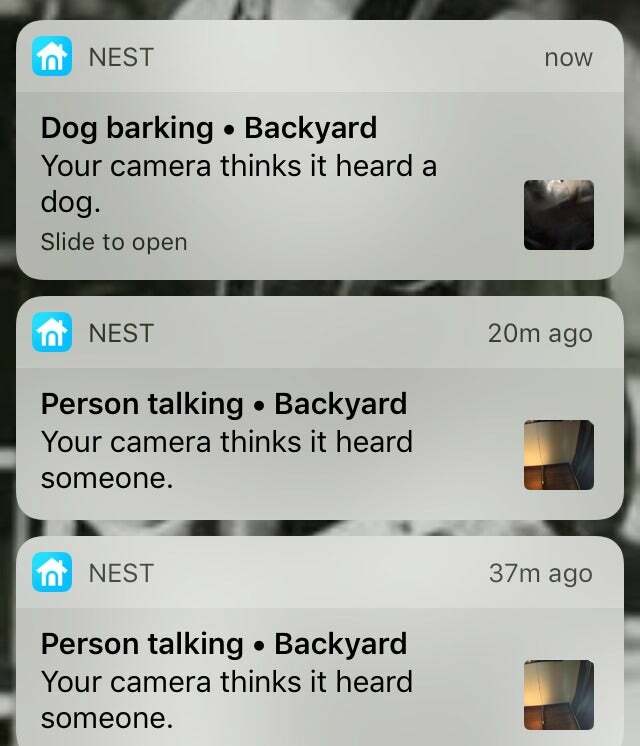 The camera easily distinguished between my dog barking and my neighbors having a conversation, and identified each activity in the notification with a zoomed-in screenshot. 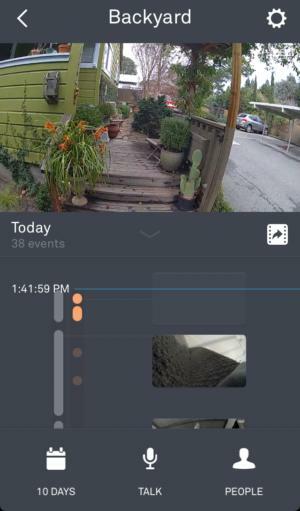 The day’s event-triggered videos are logged in a vertically scrolling timeline under the Nest app’s streaming window. You can toggle through the last 10 days of video history by tapping a calendar icon at the bottom of the camera’s home screen. You can add any video to your Nest Aware account with the tap of a button, but as with the other Nest cameras, video clips can only be edited and shared from the Nest web portal. This is also true of the activity zones feature. Using the web client, you can create motion- and/or sound-detection zones by dragging bounding boxes over the camera image. Each zone you create is denoted by a different color and number, and you can shape a zone around objects by pushing and pulling a box's handles. Activity zones greatly reduce false alerts as you’re only notified about activity within the defined areas. 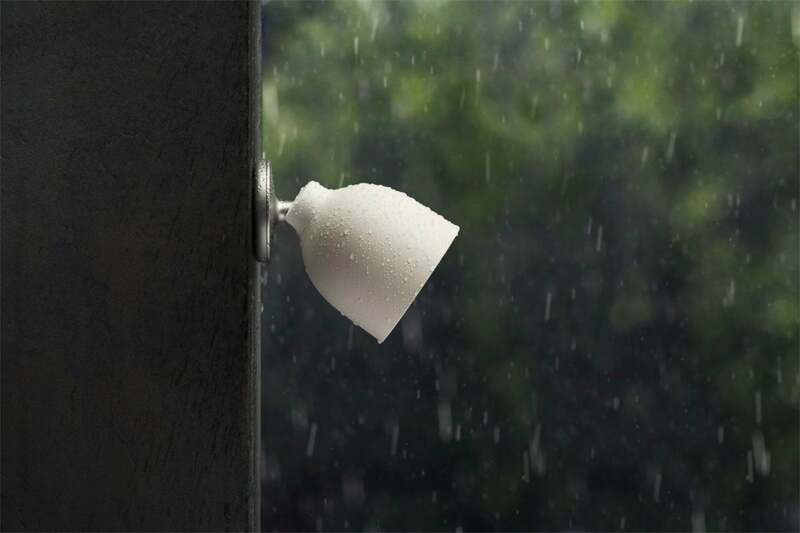 Nest Cam IQ Outdoor is weatherproofed for dust and rain. This being a Nest camera, you can extend the IQ Outdoor’s security capabilities by pairing it with a range of third-party smart devices available through the Works With Nest program or through IFTTT applets. IQ Outdoor also works with Amazon’s Echo Show—using Alexa commands, you can have it display the camera’s live feed so you can check on things when you’re home without having to grab your phone or login on your computer. There’s no question the IQ Outdoor is a more feature-rich camera than the Nest Cam Outdoor. Whether that makes it a “better” camera for you probably comes down to price and convenience. The IQ Outdoor costs nearly $200 more than the Nest Cam Outdoor, and that’s not taking into account the added cost of a Nest Aware subscription to unlock each camera’s advanced features. And the ease of Nest Cam Outdoor’s plug-and-play installation shouldn’t be underestimated. Given all that, it makes sense to lean toward the Nest Cam Outdoor if you’re buying your first outdoor camera. But if you’re already all-in on the Nest system, and particularly if you already own one or more Nest Cam IQs, the IQ Outdoor is the way to go. 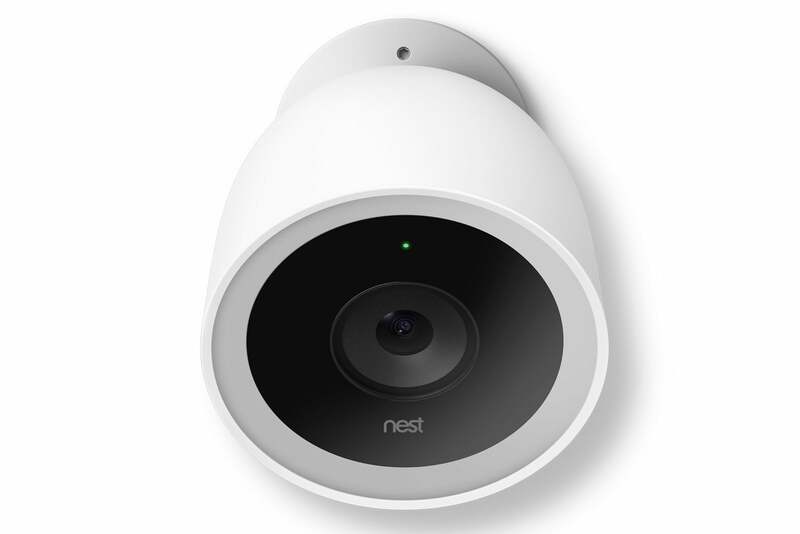 Editor's note: This article was updated on February 6, 2018 to clarify how the Nest Cam IQ Outdoor's 4K image sensor operates.